Turner Construction is the head of development for the new arena. Malcolm Drilling Company was awarded the contract to design and construct the foundation system. DBA worked closely with Malcolm to design Omega piles (a drilled and grouted displacement pile) to serve as the foundations for the new arena. The site presented unique design challenges, including liquefiable soil conditions and existing deep foundations from the demolis hed portion of the Downtown Plaza. DBA’s design incorporates 18” and 24” Omega piles. An extensive site-specific load test program was performed to determine the axial resistances of the piles. Eight test piles were instrumented with strain gauges to measure the load distribution in the piles. Supplemental cone penetration testing was performed following load testing to better correlate the load test results with the subsurface conditions. The piles were designed to resist ground motions from seismic events using site-specific ground curvature data developed by Pacific Engineering and Analysis. The piles were designed to resist the curvature at the anticipated pile section with only a single center reinforcing bar, eliminating the need to extend the entire cage to the bottom of the pile. This detail in the design is very important to ease the pile installation for the site conditions. The final design incorporates a total of 952 piles to support the arena structure (346 18” dia. Piles and 606 24” dia. piles). The new arena is estimated to cost $477 million, with $255 million of that being funded by the City of Sacramento. 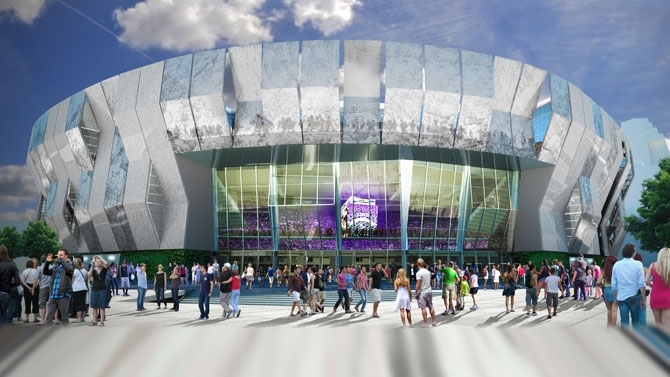 The rest of the arena ($222 million) will be funded by the Sacramento Kings. Construction began October 29, 2014 and is planned to be completed by October of 2016. The groundbreaking for the project was featured by the Sacremento Bee on October 29, 2014 (link).